This entry was posted on August 1, 2015 by Texas Safety Supply. 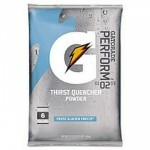 The Gatorade Powder Lemon Lime flavor contains electrolytes and carbohydrates required to keep workers hydrated so that they can work productively at the construction sites. 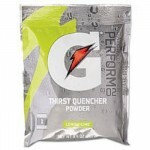 Lemon Lime Gatorade Powder is one of the most popular flavors from Gatorade. It's powdered form helps in maintaining workplace performance with the rapid absorption of electrolytes into the bloodstream, thereby helping to prevent muscle fatigue and dehydration caused by physical exertion. Health experts regard it as the ideal energy drink for the ‘’Industrial Athlete’’. 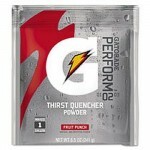 Fruit Punch Powdered Gatorade drink mix is a good source of electrolytes and carbohydrates that are needed by workers to keep themselves hydrated to work productively throughout the day. It comes with a fruity punch and can be rapidly absorbed into the bloodstream to check dehydration as well as muscle fatigue caused by prolonged physical exertion. 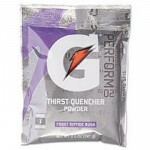 This version of Gatorade Powder is meant for tough, hot workplaces located in regions such as Texas and Florida. It is a good source of carbohydrates and electrolytes that is required to maintain hydration for maintaining a smooth workflow It will help to keep your workers fresh throughout the day. The electrolytes will get absorbed quickly into the bloodstream to check dehydration as well as muscle fatigue caused by physical exertion over a long span of time. Grape Gatorade is an ideal energy drink for construction workers who are exposed to the hot sun while working under humid conditions in different parts of Texas such as Ft Worth, San Antonio, and Houston. It will help your workers maintain a balance in their workplace performance. The electrolytes will check dehydration by absorbing within the bloodstream, and also check muscle fatigue.